NIU College of Law alumna Karoline Carstens stands out from her peers thanks to a lifelong desire to help others, a commitment to know each of her clients on a personal level and a drive to be involved with every step of her cases. 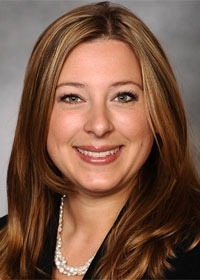 Carstens’ compassion and accomplishments, both as a lawyer and volunteer in her community, has earned her distinction and recognition from the Illinois State Bar Association (ISBA) as a Young Lawyer of the Year for 2016. She is an Alton, Ill.-based mesothelioma attorney with Simmons Hanly Conroy. Carstens was presented the award June 18 at the ISBA Assembly Meeting in Chicago. Each year, two attorneys – one from Cook County and one from elsewhere in Illinois – receive the award. ISBA Young Lawyers of the Year recipients must be ISBA members in good standing who have not yet reached the age of 36. Since joining Simmons Hanly Conroy in 2006 as an associate, Carstens has assisted in recovering hundreds of millions of dollars for her clients. Following her early work in the firm’s Complex Litigation Department prosecuting consumer class action, Qui Tam and pharmaceutical cases, Carstens focuses her practice on helping those affected by asbestos-related diseases, such as mesothelioma. Prior to joining the firm, Carstens served as an intern at the McLean County, Ill., State’s Attorney’s Office and as a legal assistant at Robert Half Legal, working on a lead poisoning case. At NIU, she externed at the Zeke Giorgi Legal Clinic in Rockford and served as vice president of the NIU chapter of Amnesty International.